The good news: There is a rumor going around about you. 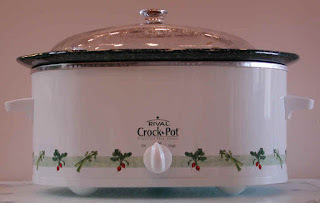 The even better news: It is that you own 20 Crock Pots! That is the rumor going around the office about me. Someone is considering having an office Crock Pot Competition. A goodly idea! I could be a contender, just as I was in the ahem, Van Cliburn Amateur Competition. Except for with Crock Pots I am no amateur. Certain co-workers derided the rumor of 20 Crock Pots as unbelievable. Above is a drawing of them whispering that it cannot be true! But I assure you it is believable. I even had a Crock Pot in California. I made dinner for Leonard Pennario in my Crock Pot. That crock was cool. It was red. I should have had it shipped back here. ... for turkey and duck. I used to make Broadway Market duck in a Crock Pot. That was when Malczewski Poultry was there. And Beverly the butcher. That is a whole other story. Anyhow I just went on counting. And I got as far as 15, anyway. The hobby gone out of control. Well, they are not all on my kitchen counter or anything. If you walked into my house you would think that aside from the three pianos everything was normal. Next time we will play the game of counting the Crock Pot cookbooks!